Another detour from my usual guess the metal logo game; sorry but this is important. Important if you care about black metal. 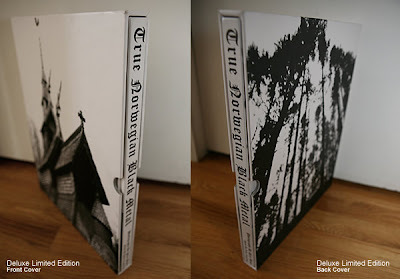 "True Norwegian Black MetalTNBM includes 126 Norwegian Black Metal Photographs by Peter Beste;Introduction by Metalion of Slayer Magazine; Essays by Editor Johan Kugelberg and Peter Beste; 3 Panel foldout black metal time line by Tara G Warrior; 32 page section of old black metal ephemera including rare and obscure photographs, flyers, letters, and interviews. " The deluxe version also includes hand numbered silkscreened slipcase, a silkscreened poster, and a signed print. $200.00. You can order it by hitting the link above. You know you want it. And my birthday is a mere 4 and 1/2 months away so if you don't know what to get me...hint hint.